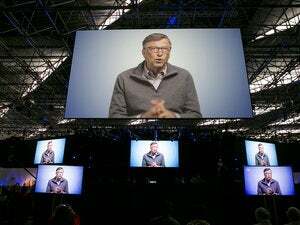 A bevy of tech executives remain among the world’s richest men and women—and atop them all is Bill Gates, yet again. Gates is worth $79.2 billion, placing him atop Forbes list of the world’s richest, just above Mexican telecommunications magnate Carlos Slim Helu. And the list of the world’s riches includes a few new names, as executives from Snapchat and Uber were named as some as the wealthiest in the world. Gates, who co-founded Microsoft and now is devoted to running a foundation named for himself and his wife, saw his net worth increase $3.2 billion from last year, despite a gift of $1.5 billion in Microsoft stock to the Bill & Melinda Gates Foundation, Forbes said. Larry Ellison, the chief executive of Oracle, is fifth on the list, just above a bevy of Wal-Mart Waltons and the Koch brothers. Father down is Amazon’s Jeff Bezos ($34.8 billion) at number 15, one spot above Mark Zuckerberg, the 30-year-old founder of Facebook that’s worth $33.4 billion. Both are richer than Larry Page ($29.7 billion, nineteenth) and Sergey Brin ($29.2 billion, twentieth), the co-founders of Google. Further down the list are Jack Ma, the Chinese entrepreneur who founded the Alibaba Group. Ma’s stake is worth $22.7 billion, good enough for 33rd on the Forbes list. And Steve Ballmer, who helped boost the average price of a basketball team when the former Microsoft exec bought the L.A. Clippers last year for is estimated to be worth just $21.5 billion, or 35th on the list. Forbes said that the youngest billionaire on the list is Evan Spiegel, the co-founder of Snapchat—though with a paltry $1.5 billion, he’s only the 1,250th richest person on the planet. Ditto for Travis Kalanick, whose $5.3 billion isn’t exactly uber alles at position number 283. (Uber co-founder Garrett Camp, and their first employee Ryan Graves, all appear on the list.) Of course, some of the valuations represent their net worth on paper, not in terms of money in the bank. Still, with the average American earning just a few million dollars over the course of their entire lives, they don’t have it so bad. Why this matters: At a certain point, money is just a way of keeping score.